This page is about the Moravian Church globally. For information about the church in a particular geographic area, use the links at Organisation below. The seal of the Moravian Church featuring the Agnus Dei. The Moravian Church (Latin: Unitas Fratrum, meaning Unity of the Brethren; Czech: Jednota bratrská or Moravští bratři), in German known as Herrnhuter Brüdergemeine (meaning Brethren's Congregation from Herrnhut, the place of the church's renewal in the 18th century), is one of the oldest Protestant denominations in the world, with its heritage dating back to the Bohemian Reformation in the fifteenth century. The name by which the Church is commonly known comes from the original exiles who fled to Saxony in 1722 from Moravia to escape religious persecution, but its heritage began in 1457 in Bohemia and its crown lands (Moravia and Silesia), then an autonomous kingdom within the Holy Roman Empire (today the Czech Republic). The modern Unitas Fratrum, with about 750,000 members worldwide, continues to draw on traditions established during the eighteenth century. The Moravians continue their long tradition of missionary work, for example in the Caribbean. This is reflected in their broad global distribution. The Church places a high value on ecumenism, personal piety, missions and music. The Church’s emblem is the Lamb of God (Agnus Dei) with the flag of victory, surrounded by the Latin inscription: Vicit agnus noster, eum sequamur (English: "Our Lamb has conquered, let us follow Him"). 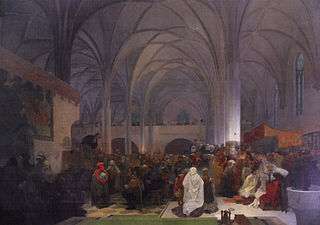 Within fifty years of Hus' death, a contingent of his followers had become independently organised as the "Bohemian Brethren" (Čeští bratři) or Unity of the Brethren (Jednota bratrská), which was founded in Kunvald, Bohemia, in 1457. A brother known as Gregory the Patriarch was very influential in forming the group, as well as the teachings of Peter Chelcicky. This group held to a strict obedience to the Sermon on the Mount, which included non-swearing of oaths, non-resistance, and not accumulating wealth. 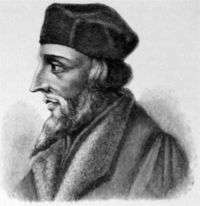 Because of this, they considered themselves separate from the majority Hussites that did not hold those teachings. 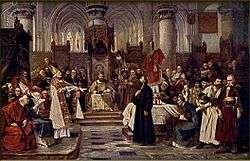 They received episcopal ordination through the Waldensians in 1467.:36 ff:107 ff These were some of the earliest Protestants, rebelling against Rome some fifty years before Martin Luther. By the middle of the 16th century as many as 90 per cent of the inhabitants of the Bohemian Crown were Protestant. The majority of nobility was Protestant, the schools and printing-shops established by the Moravian Church were flourishing. Protestantism had a strong influence to the education of the population. Even in the middle of the 16th century there was not a single town without a Protestant school in the Bohemian crown lands, and many had more than one, mostly with two to six teachers each. In Jihlava, a principal Protestant center in Moravia, there were five major schools: two German, one Czech, one for girls and one teaching in Latin, which was at the level of a high / grammar school, lecturing on Latin, Greek and Hebrew, Rhetorics, Dialectics, fundamentals of Philosophy and fine arts, as well as religion according to the Lutheran Augustana. In 1617, Emperor Matthias had his fiercely Catholic brother Ferdinand of Styria elected King of Bohemia, but in 1618 Protestant Bohemian noblemen, who feared losing their religious freedom, started the Bohemian Revolt. The Revolt started by unplanned second Defenestrations of Prague and was defeated in 1620 in the Battle of White Mountain near Prague. As consequence the local Protestant noblemen were either executed or expelled from the country while the Habsburgs placed Catholic (and mostly German speaking) nobility in their place. The war, plague, and subsequent disruption led to a decline in the population from over 3 million to some 800,000 people. By 1622 the entire education system was in the hands of Jesuits and all Protestant schools were closed. 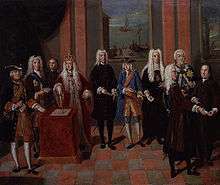 In 1722, a small group of Bohemian Brethren (the "Hidden Seed") who had been living in northern Moravia as an illegal underground remnant surviving in Catholic setting of the Habsburg Empire for nearly 100 years, arrived at the Berthelsdorf estate of Nikolaus Ludwig von Zinzendorf, a nobleman who had been brought up in the traditions of Pietism. Out of a personal commitment to helping the poor and needy, he agreed to a request from their leader (Christian David, an itinerant carpenter) that they be allowed to settle on his lands in Upper Lusatia, which is in present-day Saxony in the eastern part of modern-day Germany. 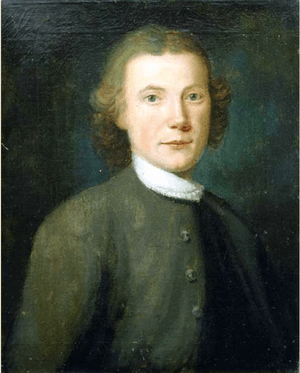 In 1741, David Nitschmann and Count Zinzendorf led a small community to found a mission in the colony of Pennsylvania. The mission was established on Christmas Eve, and was named Bethlehem, after the Biblical town in Judea. There, they ministered to the Algonquian Lenape. Bethlehem, Pennsylvania is today the sixth largest city in Pennsylvania. Later, colonies were also founded in North Carolina, where Moravians led by Bishop August Gottlieb Spangenberg purchased 98,985 acres (400.58 km2) from John Carteret, 2nd Earl Granville. This large tract of land was named die Wachau, or Wachovia, after one of Zinzendorf's ancestral estates on the Danube River in Lower Austria. Other early settlements included Bethabara (1753), Bethania (1759) and Salem (now referred to as Old Salem in Winston-Salem North Carolina) (1766). In 1801 the Moravians established a mission to the Cherokee Nation in what is now Murray County, Georgia. Coinciding with the forced removal of the Cherokees to Oklahoma, this mission was replaced in 1842 by a new one in Oaks, Oklahoma. Due to Civil War-related violence, the Oaks mission closed in 1862, and resumed during the 1870s. Finally, in 1898, the Moravian Church discontinued their missionary engagement with the Cherokees, and the Oaks mission was transferred to the Danish Evangelical Lutheran Church. The modern Moravian Church, with about 750,000 members worldwide, continues to draw on traditions established during the 18th-century renewal. In many places it observes the convention of the lovefeast, originally started in 1727. It uses older and traditional music in worship. Brass music, congregational singing and choral music continue to be very important in Moravian congregations. In addition, in some older congregations, Moravians are buried in a traditional God's Acre, a graveyard with only flat gravestones, signifying the equality of the dead before God and organized by gender, age and marital status rather than family. Eastern West Indies: Trinidad, Tobago, Barbados, Antigua, St. Kitts, and the Virgin Islands including St. Croix, St. John, St. Thomas, Tortola and Grenada. South Asia (India, Ladakh, Nepal, Assam) – under the care of the British Province. Formerly the West Himalayan Province (1853) and designated a Unity Undertaking in 1967. Tanzania is divided into five provinces because of the size of country and the numbers of people in the church. "The Moravian Church in Tanzania" co-ordinates the work in the nation. „Via exulantis“, Suchdol nad Odrou (Zauchtenthal or Zauchtel), The Moravian Brethren's Museum. The permanent exposition of the exile of 280 inhabitants from Suchdol nad Odrou to Herrnhut in Saxony in the 18th century, where they renewed the Unity of the Brethren and then established missionary establishments in all parts of the world. 1 2 3 4 "Welcome to the Moravian Church". The Moravian Church British Province. Retrieved 12 June 2015. ↑ "Unitas Fratrum". Retrieved 5 March 2015. 1 2 3 Rican, Rudolf (1992). The History of the Unity of Brethren – A Protestant Hussite Church in Bohemia and Moravia. The Moravian Church in America. ISBN 1-878422-05-7. 1 2 3 Crews, C. Daniel (2008). Faith, Love, Hope – A History of the Unitas Fratrum. by Moravian Archives, Winston Salem, N.Carolina. ISBN 0-9719411-3-0. ↑ d'Elvert, Christian (1857). "Geschichte der Studien-, Schul- und Erziehungs- Anstalten in Mähren und Oesterreichisch Schlesien, insbesondere der olmützer Universität, in den neueren Zeiten". Gesellschaft zur Beförderung des Ackerbaues, der Natur- und Landeskunde. 10. ↑ Josef V. Polišenský, The Thirty Years War, University of California Press, 1971. ↑ Knight, C. The Penny Cyclopædia of the Society for the Diffusion of Useful Knowledge, Volumes 15–16. p. 269. Retrieved 2013-08-11. 1 2 Seedtime and Harvest: A Brief History of the Moravian Church in Jamaica 1754–1979, S. U. Hastings & B. L. MacLeavy, The Moravian Church Corporation, 1979. ↑ Rose Stauber "Oaks," Encyclopedia of Oklahoma History and Culture. Accessed March 26, 2015. 1 2 The Moravian Almanac is published annually (October) as a supplement to the devotional book Daily Watchwords. Most Provinces publish their own almanac with details of local congregations and the wider Provinces. Copies may be obtained from the Moravian Church House (office) of any province (for addresses see the provinces pages). ↑ In Moravian usage, Elder is a title applicable to the members of any church board (conference) whether at provincial or congregational level. The term refers to responsible people who, commanding the respect of their fellow members, have been elected, at provincial level by the Synod, and at local level by the Congregation Council. A Board of Elders always acts collegially, not individually. ↑ "Church Order of the Unitas Fratrum", 2009, Chapter XIII. 1 2 Church Order of the Unitas Fratrum, published by order of the Unity Synod. ↑ Rt Revd C H Shawe, DD (1977), The Spirit of the Moravian Church, London, The Moravian Book Room. 1 2 Book of Order, The Moravian Church in Great Britain and Ireland, 2002. ↑ "Moravian Archives". Retrieved 5 March 2015. ↑ "Welcome to Moravian Historical Society, Your family's place to discover history". Retrieved 5 March 2015. Wikimedia Commons has media related to Moravian Church (Unitas Fratrum). "Brethren, Bohemian". New International Encyclopedia. 1905. "Moravians". New International Encyclopedia. 1905. "Bohemian Brethren". Catholic Encyclopedia. 1913.